Why are we only finding out about this now? The most well-known intern to serve in the Clinton White House was Monica Lewinsky, who served in 1995-96, likely prior to Page’s internship “under Clinton.” Lewinsky had what President Clinton would later admit was an “inappropriate relationship” with the commander-in-chief as part of a growing scandal that culminated with his impeachment in 1998. 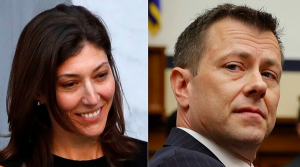 The latest text messages between Strzok and Page also appeared to refer to leaks planted in the media by “our sisters,” which some observers speculate could mean other government employees.